Painting your house can be messy and if you don’t know what you are doing, the results might not look that great. Here are some books and how to videos that will have you painting like a professional in no time. Here is my powder room that I painted on the weekend. This entry was posted in Decorating/Home reno, DIY and tagged house painting, how to paint a room, how to paint like a professional, how to paint the interior of your home, painting your home on April 30, 2014 by gplrachel. It’s hot outside so come bring the kids to cool off at any of the GPL locations! We also have Wifi so don’t forget your laptop or tablet. This entry was posted in Events and tagged air conditioning, cool down, Cooling station, staying cool on April 28, 2014 by gplrachel. I’ve always wanted to start a garden from seedlings that I have grown myself. Toilet paper tubes make the perfect little pot for growing your seeds in. You can also put them in the ground because they will breakdown over time. 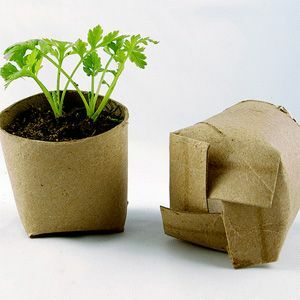 This is a great way to reuse something that you would normally throw away. Here are some great books to help you get your garden growing. This entry was posted in Gardening and tagged flowers from seeds, gardening from seeds, heirloom seeds, how to garden with seeds, Seeds on April 28, 2014 by gplrachel. This entry was posted in Events and tagged Paperbag Princes on April 23, 2014 by gplrachel. This entry was posted in The Kitchen and tagged Brad's Raw made easy, Eating in color, The oh she glosw cookbook, Thrive energy cookbook, Wolfgang Puck makes it healthy on April 21, 2014 by gplrachel. Easter is just around the corner so I thought I would post some fun Easter crafts and highlight the cool Easter activities happening at the library. Egg cartons are one on my favorite things to craft with because you can turn them into anything. For this craft all you need is an egg carton, yellow and white paint, googly eyes, glue and orange and white construction paper. Click on the image for full instructions on how to make them. My other favorite thing to craft with is toilet paper tubes because their potential is endless. These toilet paper tube bunnies are adorable and only really require paint, cotton balls and googly eyes. Click on the image for full instructions on how to make these cute bunnies. Check out these cool activities going on at the library. Spring Egg-travaganza: Watch the movie Hop, create a spring craft and then have fun hunting for eggs hidden in the Children’s Department at the Main Library. Ages 4 years & up. PG; for some mild rude humor. Come out to the Main Library on April 19th at 10:30 am for this great program. Easter Bunny Party! : Make a craft, search for Easter eggs and take your picture with the Easter Bunny. Fun for the whole family! Come out on April 19th to our East Side branch at 10:30 am or come to Westminster at 2:30 pm. This entry was posted in DIY, Events, Family Life and tagged Easter bunny, Easter crafts, egg carton bunnies, egg carton chicks, egg carton crafts, toilet paper tube bunnies, toilet paper tube crafts on April 16, 2014 by gplrachel. With spring just around the corner now is a great time to get your action plan ready for spring cleaning. I find it really helpful to make a spring cleaning list and go room by room. Here is an example of my spring cleaning to-do-list. This entry was posted in Decorating/Home reno, Family Life, The Kitchen and tagged cleaning the home. cleaning, how to clean, Spring cleaning on April 14, 2014 by gplrachel.